Who knows what would have happened if George Reynolds had kept faith with the Sunderland legend, now a regular on BBC Radio Newcastle’s commentaries on the club. Benno was David Hodgson’s successor in the wake of that painful play-off defeat to Peterborough United at Wembley. He seemed to be doing a decent job, with the play-offs in his grasp, when the chairman appointed Tommy Taylor from Leyton Orient as his manager instead. It was the beginning of the end in the on-field collapse, mirrored by the off-field catastrophe that came with the stadium move. ‘I look at where they ended up and think ‘I could have been successful and done better than that, surely’. ‘Hindsight is a wonderful thing but the club could have gone on a very different path. It would have been extremely difficult anyway with all the troubles behind the scenes and I don’t know if I would have been able to change what happened in the end. ‘Unfortunately Tommy Taylor lost his job and George fell for what he was going to do with the club and where he could take it. 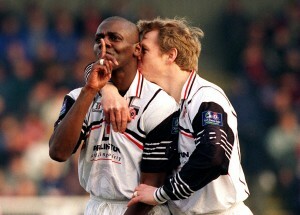 Manchester-born Bennett, now 54, joined Darlington after his second spell at Sunderland came to a close. The imposing centre-back, who had become Sunderland’s record appearance holder over more than a decade at Roker Park, was David Hodgson’s on-field marshal and off-field coach in that fateful, near-promotion year. He said: ‘I should have played more games but I had an injury which was called bone bruising, where the bone bled on the inside, so I was out for most of the first season. ‘I had gone in as a player-coach under Hodgy, so I was able to concentrate on that aspect of the job but it was a frustrating time because there was not much I could do about the injury. ‘We should have gone up automatically. With the way we were playing, it was in our grasp but we just lost games at vital times and lost the momentum that takes you up. ‘It was obviously a great experience playing at Wembley against Peterborough in the play off final but it was a horrible night and we just didn’t perform. It wasn’t all doom and gloom during Benno’s time, spent during the transitional phase between Feethams and the Arena. There were other great memories, such as the memorable FA Cup games against a very different Manchester City to the one which is in the Champions League today. The disparity between the two clubs since that 1998 meeting is extraordinary. When Hodgy grew tired of the constant conflict, Benno was offered the job. He has no regrets answering the call, even if it ended badly. Bennett defiantly stayed on as reserve team coach and had to witness the implosion from close quarters. Like his Murphy’s, Bennett is not bitter. But as he reflected on Darlington’s demise and resurrection, he still thinks. What if.,. Bennett said: ‘The question after Wembley was could we repeat it, keep the players we needed to get promotion but the club was all over the place off the field and then the battles started with George and Hodgy and one day he just decided he’d had enough. ‘George came to me, offered me the job, and of course I spoke to Hodgy first, and took it, making Jim Montgomery my number two. ‘I could have turned it down but it was a great opportunity to manage a league club, especially as there were only two other black managers at that time. ‘And working with George was an eye-opener. He had some good ideas, and he had some which were less good. But he was always very opinionated about them all. ‘He put Darlington on the map that’s for sure. I could understand the idea that we had a stadium that was only used for around 30 days in a year as a commercial enterprise. But did the move backfire? Yes it did. ‘The atmosphere at Feethams was special. Teams hated playing there and it was wonderful when it was full. And we could have filled it if we’d gone up. In many ways it was nice to move into a new stadium and it made some sense. Just not one on that scale, on reflection eh? ‘Managing a league club was a great experience for me. I learned so much from it. I knew the ins and outs of running a club, coaching, looking after the squad, organising away trips, budgets, everything. Benno has remained active in coaching successfully managing Sunderland University’s ladies’ team. But like so many former players now, he is well-known as the voice on the radio, taking commentary duties with BBC Newcastle on Sunderland’s matches, home and away alongside Nick Barnes. He said: ‘More and more ex-footballers are going into the media. When I was a player, you might chip in with the local radio commentary if you were injured, but now there are co-commentators assigned to games and teams and it has gone to another level. ‘You have to enjoy it. It is a job but you have to have a love for it and understand or have a feeling for the game you are watching. ‘When I left Darlington I had about eight months out and then took the job at Exeter alongside Neil McNab, going in as joint coaches. ‘Let’s just say Exeter were not going through the best of times financially and off the field there was a lot of turmoil and the players and staff weren’t paid for three months at one stage. ‘It felt like it was starting all over again for me after the experiences at Darlington and inevitably Neil and I left. ‘When you go into management you don’t realise that the job really is 24/7. It was a great opportunity and I loved every minute of it but when you are in the job there are always people after your job, pushing themselves forward. ‘I was lucky to get back into football very quickly on the media side and as you get more established in it, you build a reputation and of course it becomes harder to walk away. I have had offers but a job can be offering a week, a year, and rarely longer than two. Then I’d have to go back to square one in the media. And it is in Sunderland where Bennett has the day job now. He has set up the Back2Basics academy in his adopted city, with fellow former Mackems Julio Arca and Keiron Brady, plus former Middlesbrough defender Dean Gordon. The idea is to offer educational and employment opportunities in the game to the large number of lads discarded by the top teams in the region. Bennett said: ‘It will take a year or so to establish and get running but we are on the right path. Hopefully we can provide some insight to keep lads in the game and find opportunities for them. ‘We’ve all been there and seen it and done it and we can give them an insight into all aspects of the game, which they can’t get from their parents or teachers, perhaps.